Don't you love a Rainy Day! Don't you love a rainy day!!! That's what the triplets say to me when we do lots of little errands on a rainy day. Today, it's raining cats dogs and skunks too. As you might have read in Auntie Donna's blog, she had quite an ordeal to find a webkinz for Caitlin earlier this week. After much effort and searching every gift shop in the Annopolis Valley, she found a skunk. 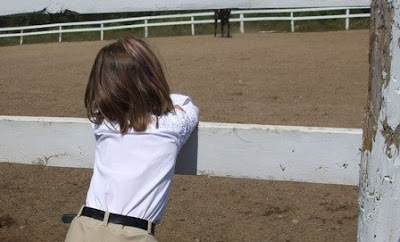 Caitlin was so pleased to read this news on Auntie Donna's blog yesterday. 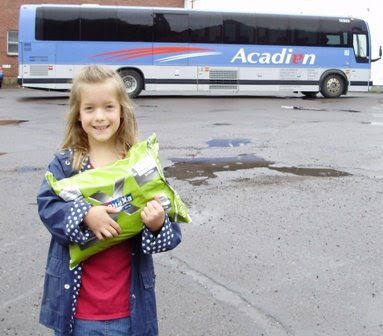 The skunk is coming to us by Acadien bus lines. So, Caitlin came with us to run all our errands this morning. A trip to the bus station was one of the first things on our list that we did this morning. 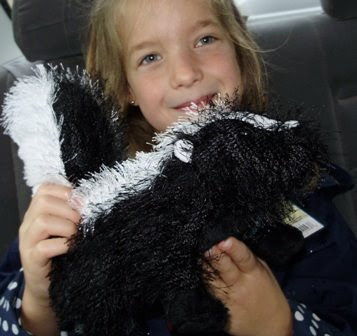 And here is a picture of Caitlin and her skunk who she named Kit-Kat. A much better name than Stinky!! That Auntie Donna, she's a good egg to put all that time into making sure Caitlin was pleased with her wedding gift from Michelle for being a Flower Girl. Auntie Donna also sent up fun treats for the kids and some treats for me too. It sure was fun to get the package by bus. I won at Don't look Now!!! That's the name of an Australian quilters blog that I follow. Besides being a busy mother, she's a pattern designer and teacher. 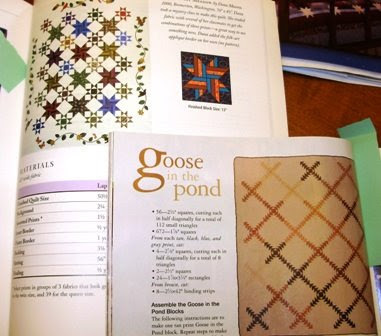 I love her girly and cute patterns that she developed for quilting magazines. She's has some awesome give-aways at her blog and I've been eying her patterns for some time now. I had planned to buy this Rainbow Lollipops pattern soon on her website once things settled down from the wedding. And guess what.. it turns out that I won a pattern on her blog post from July 22. So now I'll have 2 patterns. She's in Fiji right now on a winter vacation, so I'll let you know when I get my package and show you. Yippee. I love it when I win things. She has a free pattern on her website too, for a pillow. It's sweet. Go check out her blog here... Go look at her archives because there are some amazing pictures of some of her patterns in development. I love them all. Also, did you know it's Winter in Australia? I keep forgetting that. It's a 30 degree hot day here in Eastern Canada. We've been waiting a while for it, so I'm glad the dry weather is here. 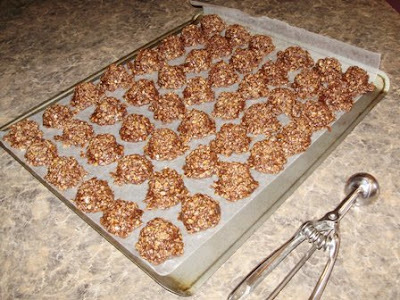 My sister and our cousin Sandra always called these yummy no-bake cookies "Frogs". I've always found that an awful image... "eating a frog" that is. I first made them when I was a young housewife - almost 35 years ago. The recipe came from a home made cookbook made by the Fundy 4-H Sewing and Handicrafts Classes in Hillsburn Nova Scotia. In looking through the acknowledgments in the book, it looks like around the Lawrencetown area in the Annapolis Valley. Last names of many of the leaders of this 4-H group were Longmires, Hamiltons, Hallidays, Potter, Chute, Brown and Kaye. Funny, my sister now lives near there, although she didn't when I first got this book in 1974. I wonder if she knows any of these families now.. I really like this recipe because it makes a perfect 48 macaroons using my small one ounce scoop and the ingredients list is simple. You can make them up in 10 minutes flat. Why not give them a try. Bring these 3 items to a hard boil for 30 seconds in a medium size saucepan. Mix all the ingredients well and drop by spoonfuls (or scoopfuls) onto waxed paper. Let set for 20 minutes. Be careful, the mix is hot. I'm a faithful watcher of Oprah's Dr. Oz. This week, I watched a rerun of Dr. Oz's beauty secrets. I learn something absolutely every time I watch one of his shows. Even when I watch the repeat shows, I learn something. On this weeks show, they talked about skin care, especially the face. They talked about the importance of exfoliation. So, off to the drug store I went, looking up and down the beauty products aisle just for exfoliation products. I can't tell you how many times, I've gone to the drug store and picked up something only to try it once and never use it again. 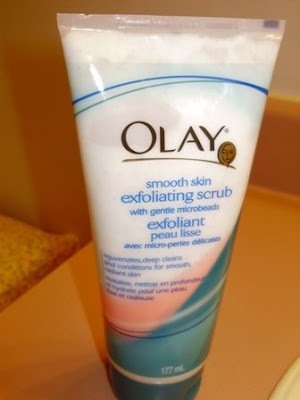 Not so for this Oil of Olay Exfoliator. I love, love love it. I have used it in the shower 3 times this week, and I can say, that I'll probably continue to use it faithfully. This is a gentle cream that has the smallest amount of micro beads in it. I only use a dab about the size of a dime. It rinses off quickly and makes your skin feel soft, not dry. Way to go Dr. Oz. Now if I could only find a really light face moisturizer that has sun block in it. 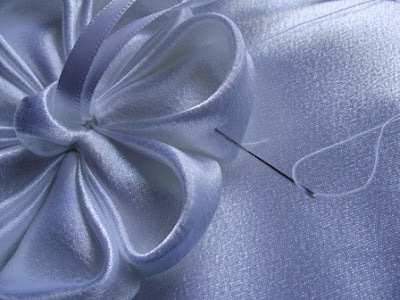 So, the wedding is over and all week, I've been thinking of what sewing projects I'll work on next. I suppose always can resort to my unfinished list of projects. I do have a couple of new small projects that I want to do, but I think I should finish at least one or two things that I've started. So for now I'll show you bits of a house project that I'm working on with the Friday girls. 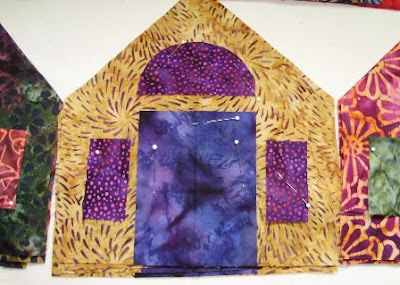 It's a small project where we are all trading houses made out of batiks and then we're making a table runner in September after we do our trade. This is a fun little project that can be done in 15 - 20 minute chunks. For me once I get my colors picked, Another 20 minutes of fabric cutting, and another 20 minutes of sewing, and I'm ready to trade houses. For some of my houses like this one for example, I'm not sure that I have enough contrast so I'm going through my bits of bali/batiks to find better contrasting windows and doors. This house is an example of almost too much contract, but it's staying. Once the houses are cut in half and sewn into the project, it'll be fine. 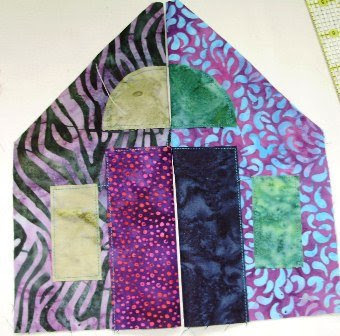 After we trade our full house blocks, we'll cut them in half and sew them together, like this. It's a really cute small project but I will only get to show you my finished project in late Sept. I'm really excited to have lots of leftovers bali/batiks from this project, because I'm going to make a Bali/Batik Maritime Beauty table mat. 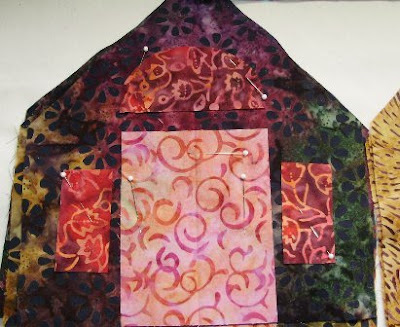 I've already finished the one I did with Karen Neary workshop one in true scrappy style, which I love and use at the cottage. Now it's time to make a really nice one for my house. So here are great pictures that I took of the kids by family. I'll always cherish these. My, they're a bunch of great kids. Look at the nice smiles these sisters, Jessica and Emily have. And this is after the wedding, after the photographer's session, and just before the reception. Mitchell couldn't help himself. The big guys had pictures done with these cool RayBan sunglasses. 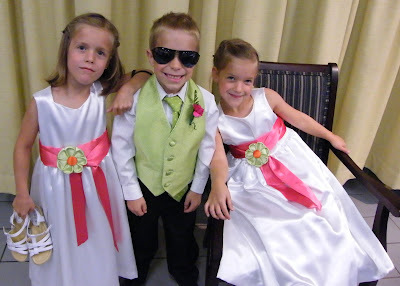 Mitchell borrowed a pair to pose as the cool guy with his sisters. So this is after the wedding, after the photos, and all she wanted was a little quiet time. The cameras clicked all day on little Aurora. 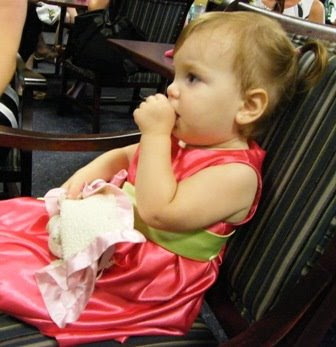 She was so cute toddling around in her pretty dress. I can't wait to see the official photos. But until then, I've been looking at my photos every few hours. I got some cute ones of my crew.. Here is my sister - also known as Auntie Donna. 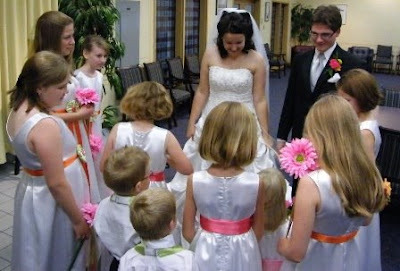 She is giving final instructions to the junior wedding party. Walk Slow - Smile Big for the cameras - Have Fun. Doesn't she look great and too young to be Mother-of-the-Bride. This shot is of the bride and groom talking to the junior wedding party after the wedding and they are waiting for the photos to start. Scott and Michelle were telling them what an awesome job they did. The groom didn't have near as many attendants as the bride, but they sure did take care that everyone looked spiffy. 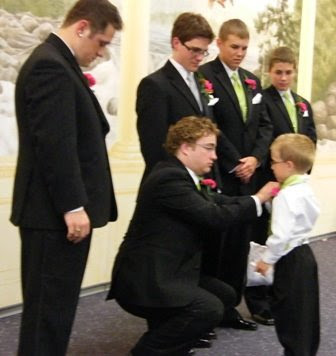 Here is the Best Man primping Mitchell with care just before their photos. My sister has some amazing friends who helped prepare for the wedding in many many ways. Last year upon the announcement of the wedding, my sister's good friend offered her home to our large family for Michelle and Scott's wedding. We can't thank her enough for her kindness. 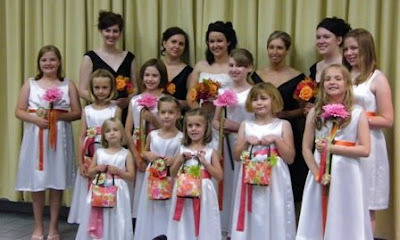 Because of this, we got to fulfill the brides wish to have a large junior wedding party of which, we contributed 6 kids. We so enjoyed being altogether at her impressive home to get ready for the wedding. 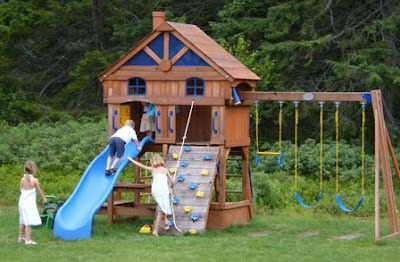 Within one minute of arriving in Greenwood, our kids found Chantal's play set out back. They were so impressed, and it was just the beginning to an exciting weekend. I heard the kids say WOW 50 times if I heard it once! It's now even a new word for Baby Aurora. Wow... Yes, even she got in on the play set action. Do you see her inside the little house just above the slide? 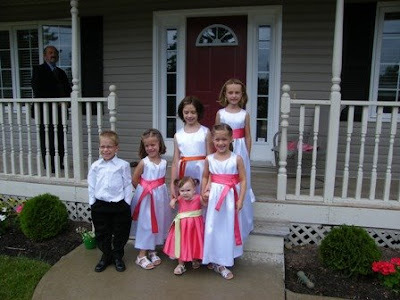 It's almost 4pm on the wedding day...Here are the kids on Chantal's doorstep, ready to go to the church so Mitchell could get his lime green tuxedo vest and tie. 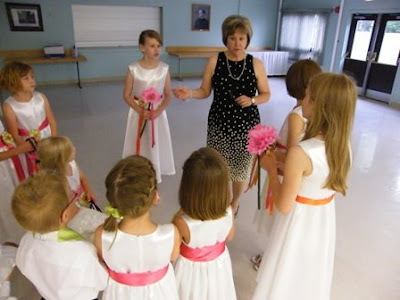 Also, Auntie-Donna is going to pin on the girls sash flowers. We're so excited. We can't believe it. The time is almost here. For your trust and kindness, we can't thank you and your family enough for the use of your home. We're back from a beautiful wedding of Scott and Michelle Matheson. They're now on their way to PEI to spend a few days of honeymoon. There is so much to say, but I know everyone wants to see a few pictures. First above is a picture of the Bride and her attendants. 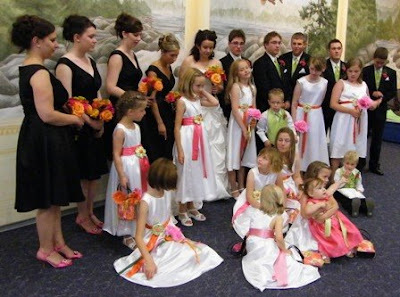 The next picture is of the entire bridal party. Aurora walked down the aisle many times at the rehearsal. But when it came time for the real wedding, all the people in the church was just a little overwhelming. After about 10 steps up, she got scared, and turned around. No problem. 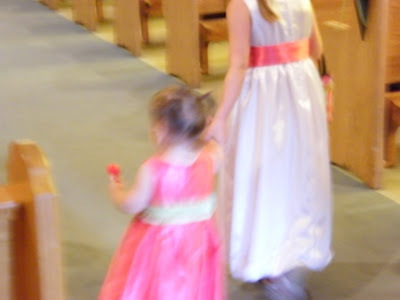 I walked her up the aisle, and she was ok with that. We don't have too many pictures with Aurora in the official photos. But here is one that I took with my camera as the official photographers were setting up the shot. 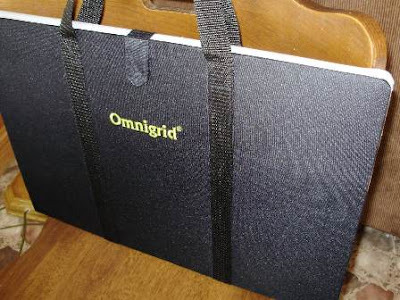 A few weeks ago, I used by 50% off coupon at Michaels to buy this Omnigrid Cut and Press. I took it to the cottage to use on small weekend projects. I used this this past week for the first time. I absolutely love it. It's the perfect size for the space that I have to work in my little cottage kitchen. 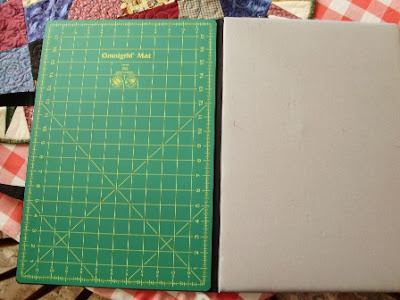 Each side is 18 inches by 12 inches and it folds up flat and is held shut with a piece of Velcro. I'll definitely get a lot of use out of this at the cottage, at quilting workshops and it'll come south with me in the winter. I love getting a new sewing gadget that is truly useful! 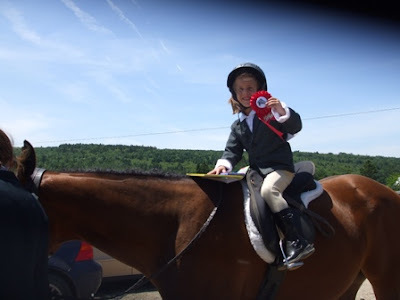 Grace had her very first horse riding competition today. She was all dressed in proper riding gear and she's a real horse girl. She's been taking riding lessons all winter. So at the competition, she waited patiently. It was the hottest day of the year. She waited and waited for her turn to compete. Finally, it's her turn. Here she is. She's riding Dixie today since her regular horse, Melodie, had to get a new shoe. Yippee, she placed first! 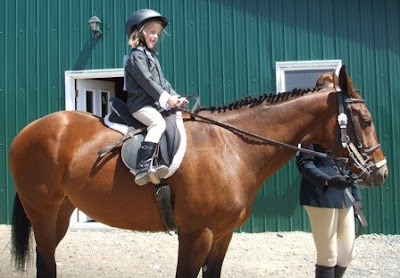 Isn't that amazing, that Grace, as petite as she is, has control over such a lovely but large horse. CONGRATULATIONS GRACE!! We're so proud of you. Remember Emily, she's the one who we made the french rose quilt for last year. 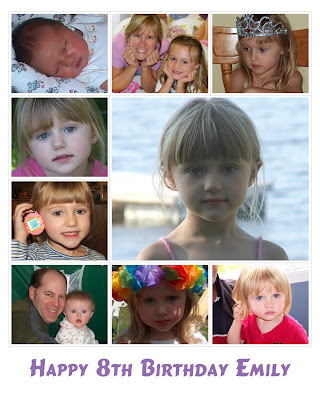 It's hard to believe that Emily, our beautiful and smart granddaughter's turning 8 years old. Look at that beautiful baby picture. She was a beautiful baby and before our eyes, she's turned into a young lady. When Emily was a little toddler, she loved cats. Now she loves all animals and she loves to read. In fact, she reads at the top of her class and the teachers are so impressed with what a nice student she is. We're so proud of her. 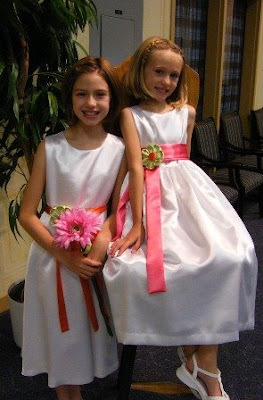 Have a great Birthday Day Emily and we'll think of you on Saturday when you have your friends over for a fun party. As you might have guessed, today at that time, I was in my sewing room. I heard on the radio today, that this phenomenon only comes once each century. That is, that the numbers 1.2.3.4.5.6.7.8.9 correspond with the exact time and date. So today, the 8th of July, 2009 at about 12:34ish, I was working on a little project that I'm making for Scott and Michelle's wedding, which is July 18th, 2009, next weekend. So what were you doing today at 12:34 today? I'm getting ready for a visit with Rose. She's the spry eighty something lady who is my point of contact for the St. Dunstan's church quilters. Every year, I sew a quilt top for this group of sweet ladies. They hand quilt it and then sell tickets on it as a fund raiser. These ladies were all piecers and appliquers at one time, but not so much now and get me sew their annual raffle quilt. So typically this time of year and with them in mind, I go through my quilt patterns and photos of quilts that I like, I flag about a dozen quilts that I'll present to them as a group. They decide which pattern and give me some feedback on colors. Then I have the next 6 months to buy the fabrics and make the quilt top. I'll deliver it to them next January. Like many other fund raising efforts, it's getting harder and harder every year to get those raffle dollars, and over the years, they have a complied a few things that they keep in mind when selecting their raffle quilts. I'll share their tips with you in case you are ever asked for an opinion. Know your customer... For these ladies, they sell tickets in church, at church suppers, in malls etc. So they know from 20 years of experience, that a traditional quilt is a must. 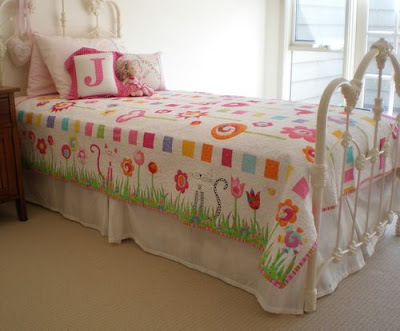 While art quilts are well appreciated, their customers are very traditional and love the utility use of a quilt for a bed covering rather than hanging it on a wall. Take the color excuse out. 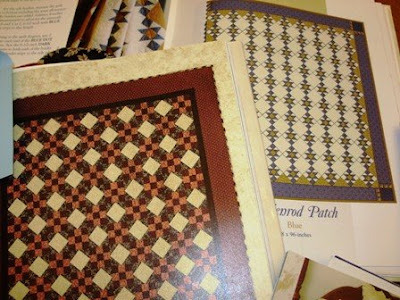 For the times that they have had a 2 or 3 or 4 color quilt for their raffle quilt, they would have customers not buy tickets cause the quilt wouldn't match "their colors". They heard that time and time again. It's obviously an excuse not to buy tickets, so now, I typically make multi-colored quilts that look like scrappy quilts, but the fabric is purchased to blend together. Queens all around: Everyone always asks about the size of the quilt being raffled. From the experience of these ladies, it's impossible to sell tickets on anything but a queen size quilt, so I always make one that is between 82 and 86 inches wide and about 100 long. The length is not as important. So with all the above factors considered, here are some of the pattern choices that I have for them. I'll let you know top two favorites at the end of this post, and I'll report to you after my meeting with Rose, if they chose one of them as their favorite too. Either one of these would be a nice change for them. The first one, "Birds in the Air" might be a little too blue, but we could do shades of blue, maroon and green. The second one, The Dutchman's Puzzle might have too many seams for them. The last time I visited, they mentioned something about too many seams in the Nines and Vines quilt that I delivered to them last January. These 2 are very traditional but they might be bordering on too color specific. They would be an easy and quick sewing job for me though. If they wanted to go with a single color palate (which I don't think they will do), I think these are nice choices. I really like this star quilt. I haven't done stars for them in a while. I like the different size stars in this pattern. The geese quilt on the lower corner of the picture is quite plain but if I add a nice border, I think the white space it would show off their great hand quilting. These quilts are all good quilts in my opinion. I like the log cabin. I'm not sure if this one with the star on it will be traditional enough for them, but we can ax the stars if they want. The other 3 quilts were quilts that they liked at the Elm City Guild show last year. So, what am I hoping they pick?? 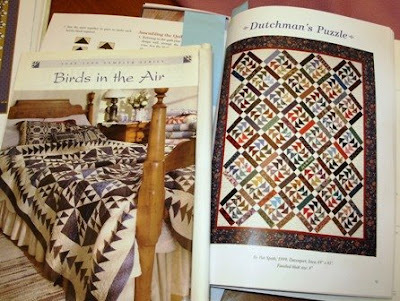 I am hoping that they pick either of the top two quilts, Birds in the Air or the Dutchman's Puzzle Quilt. I haven't sewn either one of these quilts before, and I think it would fun to sew. 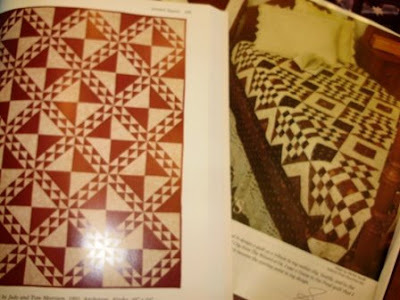 And you know, I've never made a log cabin quilt, so I wouldn't mind making one of those. The Split Nine Patch in the bottom photo is nice and on my "want to make list". And I've always wanted to make a single color plus white quilt like the red one..... OK, OK... 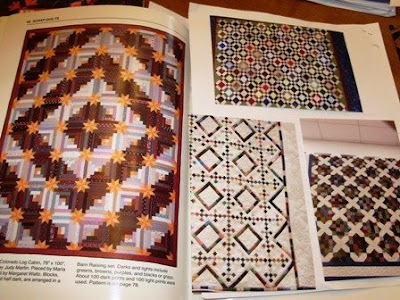 I would be happy to make any one of these quilts!!!!! I'll let you know in a couple of weeks, what they select. 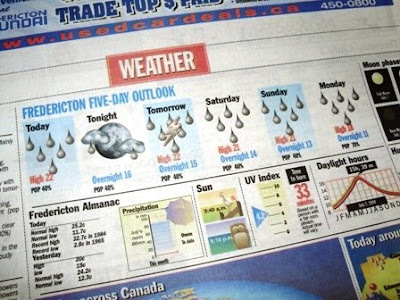 As you all probably know, the damp weather has been with us since June 17th, but who's counting. We're trying not to talk about the weather, and we're adding different things to our daily outings, just to break up the overcast monotony. 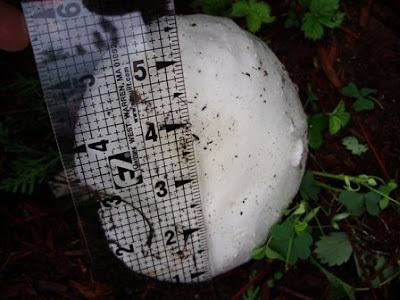 But this morning, this giant mushroom pops up beside our cedar tree and we just had to laugh. This got me thinking about mushroom soup. I found this Asian mushroom soup on the food network. It is not the traditional creamy mushroom soup and the picture looks yummy. I'll be cutting the portions down on this recipe and trying this soup soon. 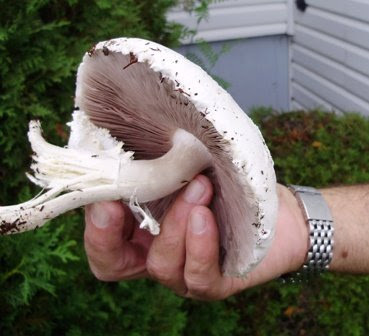 But not with our new found giant mushroom. I'll buy some grocery store ones to make this recipe.. I am doing really well with the revival of my running program. I have completed my physio therapy on my knee and it's feeling almost normal again. You can't imagine how good that feels. Right now, my 45 minute workout has me running 5 minutes and walking for 2 and there is a bit of time for a warm up and cool down. I'm running a total of 30 minutes out of the 45. It won't be long and I'll be up to my 35 minutes of running with only 1 minute walking breaks every 10 minutes. I'm really keen and quite pleased about getting my running shoes back on. 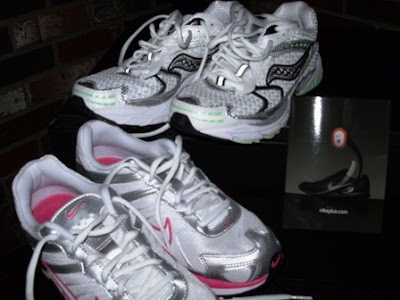 I was in the running shoe store today, and they had buy one pair, get one free this week. What a deal. So now I have a pair of Sauconys and a new pair of Nikes. The Nikes have a hole under the insole so that I can put my Ipod - Nike tracker. This little thing wireless connects to my Ipod Nano and it records the distance and speed that my shoes are moving. And as long as I'm in the shoes, it gives me a pretty accurate of my workout. Now I'm building some new 45 minute playlists to listen to. I'm not good with picking peppy music, so building these playlists is harder than it sounds.